The top grant recipient was Community Bike Works for their Bike to Sustainability program which was fully funded at $18,000. The youth of Community Bike Works recycle hundreds of bicycles a year, working with mentors to refurbish donated bikes they can ride across the city. The grant will enable Bike to Sustainability project to work with students to build a stronger culture of sustainability, serving more students in the Earn a Bike program, and offer those students more meaningful experiences in nature, including the opportunity to create and maintain a bike trail. Finally, students will travel to Washington to attend the Youth Bike Summit and will help develop a sustainability plan for the organization. Other organizations receiving grants included the Greater Easton Development Partnership which was awarded $10,000 for their Easton Compost Project which will serve as a pilot to provide food waste education and a composting option at the Easton Farmers' Market for market vendors and also for a pilot group of local residents. Project data, experiences, and costs will be collected and shared afterwards. The Bethlehem Economic Development Corporation also received a $10,000 grant for Reimagining the Bethlehem Rose Garden. The grant will be used to engage a landscape architecture firm to develop a revised plan for the park, creating a map and inventory of structures and trees, noting species and condition. The new plan will add signage and walking/cycling paths. Native gardens, and understory and specimen trees will be planted, and bike racks sited. Wildlands Conservancy was awarded a $7,000 grant for their Collaborative Watershed Education Program. Wildlands Conservancy and Lehigh Gap Nature Center will collaborate to provide multiple watershed education experiences for students from low-income neighborhoods in the Lehigh Valley. The Watershed Coalition of the Lehigh Valley received a $5,000 grant for their Youth Watershed Steward Program that creates school-district based, county-level coordinated 'stream team,' reaching youth where they live and go to school in learning and hands-on projects that relate to environmental assets and challenges in their communities. Help us give more to this issue and raise awareness in 2017 by making a tax-deductible gift with our PayPal account. LVCF donor-advised funds can provide support with a simple email request. GET INFORMED. Learn more about environment and sustainability by viewing the five finalist videos. These organizations are tackling this important issue in the Lehigh Valley in a creative and collaborative way. The Environment’s Impact on Economic Development Explained at "How Green is Our Valley? Lehigh Valley Community Foundation (LVCF) announced the recipients of $50,000 in Spark Grants for environment and sustainability programs. The announcement came at the Foundation’s program, “How Green is the Valley?,” Cindy Adams Dunn, Pennsylvania’s Secretary of the Department of Conservation and Natural Resources, and Michael Stershic, president of Discover Lehigh Valley the Pool Wildlife Sanctuary Pavilion, Wildlands Conservancy on August 2nd. 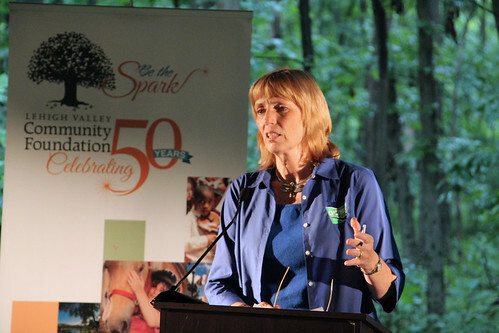 The Spark Grants are part of the Community Foundation's 50th-anniversary celebration. The program is the fourth in the Lehigh Valley Community Foundation’s 50th Anniversary Spark Grant celebration. After the keynote presentation, the Community Foundation will award a total of $50,000 in grants to the five organizations who were selected as finalists who are addressing the environment and sustainability issues in Lehigh and Northampton Counties. Bernie Story, president and CEO of the Lehigh Valley Community Foundation, presented the grant awards. Story was joined by Greg Butz, president and CEO, Alvin H. Butz, Inc., and a member of the Foundation’s Board of Governors, who presented the results of the video voting campaign and share the videos. In addition to the talk and grant presentations, Wildlands Conservancy President Chris Kocher, and Lehigh Gap Nature Center Executive Director Dan Kunkle led guided hike. After the program, a reception was held where people interacted with Wildands wildlife. Environmental sustainability is a state in which the demands placed on the environment can be met without reducing its capacity to allow all people to live well, now and in the future. Environmental sustainability promotes systems and actions that support human well-being and are compatible with sustaining natural (environmental) systems. These systems provide ecological services vital for human survival, typically consider long time horizons, incorporate contributions from the social sciences and ethics, and seeks to balance society's need to provide ecological protection and maintain stable economic conditions. In 2013, a survey distributed by the Lehigh Valley Planning Commission found that Lehigh Valley residents felt that clean air and water quality should be a top priority for improvement in the region. According to U.S. Census statistics, nearly 95% of the region’s labor force uses a car to get to work, school or shopping, increasing fossil fuel emissions into the atmosphere. Only 15% of Lehigh Valley residents live within walking distance of a school or grocery store. Since 1930, the Lehigh Valley has lost 80% of its farms and 53% of its farmland. Based on the average diet, Lehigh Valley farmers can only produce food for 24% of the Lehigh Valley population. From 1964- 2010, the amount of available agriculture and vacant lots decreased from 74% to 48%. Only 9% of the Lehigh County is preserved and 2.3 square miles of farmland is being lost to development annually. In Northampton County only 5.92% of total acreage is preserved.